These Regular size meerschaum pipes are all carved by hand from the finest whole block meerschaum mined from the plains outside of Eskisehir, Turkey by our skills craftsmen. 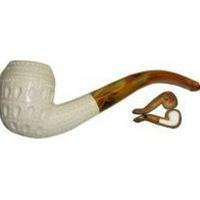 These pipes are comparable in size to a standard briar pipe. Each pipe comes safely enclosed in its own, custom-fitted leather case with a velvet lining to protect your precious pipe from damage.